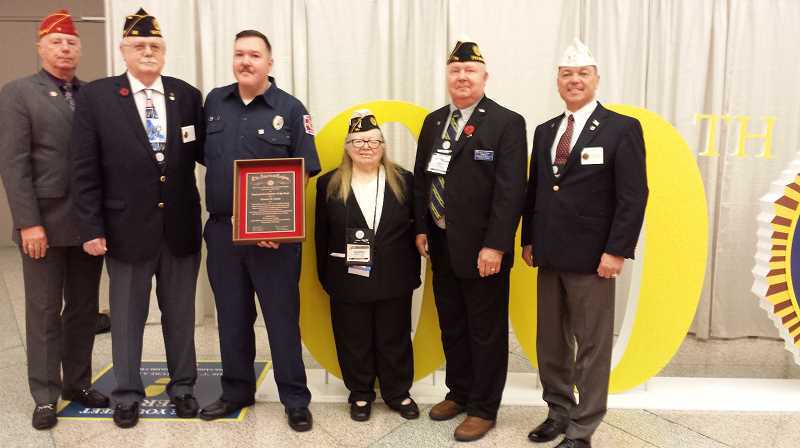 Estacada volunteer firefighter Damon Faust was honored for his service Tuesday, Aug. 28, when he received the American Legion National Firefighter of the Year Award. The announcement was made during the American Legion's 100th National Convention in Minneapolis. Faust has been a member of the Estacada Rural Fire District since 2016. He helped develop the district's Veteran to Firefighter program, which uses fire service to help former service members acclimate back to civilian life. Earlier this year, he also served as the grand marshal in the city's Fourth of July parade. Prior to his work in Estacada, Faust served in the U.S. Army. During his deployment to Baghdad in 2005, he rescued two civilians from a burning building. He later received the Soldier's Medal for Heroism for these actions. "I'm extremely, extremely honored (to receive) this award," Faust said during the American Legion National Convention. "But we all know there are folks out there on the lines doing as much, if not more, going unrecognized."